Growing up in San José, the capital city of Costa Rica, Gerardo never felt like he belonged in the concrete jungle, and always dreamed of being surrounded by nature and close to the ocean and the outdoors, where he felt at home. 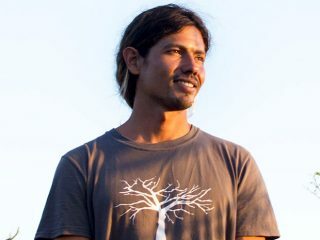 After graduating from a Bachelor degree in Biology with an emphasis on Ecology and Sustainable development in Universidad Latina de Costa Rica, he immediately moved to the oceanfront and layback community of Nosara in Guanacaste, where he would be finally able to develop his knowledge in nature conservancy and fall in love with surfing. His professional background goes from being the Sustainability Coordinator at the Harmony Hotel (Nosara) for over three years, to managing the Surfing Nosara Foundation (benefiting the public schools in Nosara), to co-directing the Costas Verdes Coastal Restoration NGO for over five years, and managing the Costas Verdes project in Guiones Beach, BarriGuiones, since May 2011. Gerardo also loves sharing his passion for the ocean by teaching surfing in his time off. Some of his passions are spending as much time as he can with his dogs, slack inning, playing guitar, traveling, road tripping, and exploring nature.